With so much new music available today, sometimes it’s good to look to the past. Welcome the JAG Classics where we examine the albums of yesteryear. Today we look at Abraxas by Santana. Hailing from the San Francisco Bay Area, the Latin-rock band Santana (with Carlos Santana on guitar) created some of the most diverse and experimental music of the late 1960’s. After the success of their 1969 debut Santana and a performance at that Summer’s Woodstock Festival, the band reentered the studio to craft a worthy follow up. The result was 1970’s Abraxas that fused rock, blues, jazz and salsa into a sound that came to define the group. In all music, the West Coast operates at a different pace than the rest of the United States and the World. What the G-Funk sound was to 90’s hip-hop, Santana’s melting pot of sound was to the late 60’s and early 70’s sound of rock. It seemingly came from outer space, and was flat out revolutionary. A simple organ part, pretty rad percussion and Santana doing Santana things make “Oye Como Va” come to life. The group vocal is nice, letting poor singers like myself sing along with out feeling awkward. 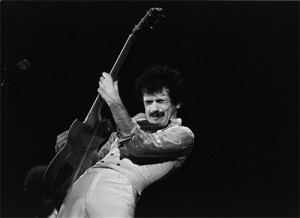 The band operates much as a jazz band, allowing Santana and Rolie to get loose for extended guitar and organ solos, before wrapping it up with the chorus and one more extended Santana guitar coda. Rolie comes back on “Mother’s Daughter” singing about evil women again (a common theme on Santana songs), but the song is a Santana showcase. “Mother’s Daughter” is like a Zeppelin song, if on their first album, they just let Jimmy Page solo over organ fills. The song is more driving than most on the album which makes it stand out even more. “Hope You’re Feeling Better” is a straight up funk jam, which just about rounds out an album that takes you all over the music spectrum. The thing about Santana (as a band) is that they’re unbelievably cool and Abraxas is a perfect example. When bands rely heavily on musicianship, the music can veer off the rails. When this happens, the group usually pulls it off, but you can hear the struggle. You never get that listening to Abraxas. The band is so fluid and loose, you might almost believe that they recorded every song in one take. And while Santana is the namesake, he only wrote two of the songs, fittingly both instrumentals, which gives you a greater appreciation of how talented this band truly was. For anyone looking to dive deeper into Santana’s legacy, Abraxas is the perfect place to start. Have an album you want us to check out? Make sure to drop it in the replies. If you enjoyed this post, let us know by leaving a comment. A certified personal trainer and graduate of Northwestern University (M.A. in Sport Adminstration), Steve is resident fitness expert and music snob of JustAGuy. In addition to fitness and music, Steve also enjoys sports. Feel free to trash talk him at steve@justaguy.us.